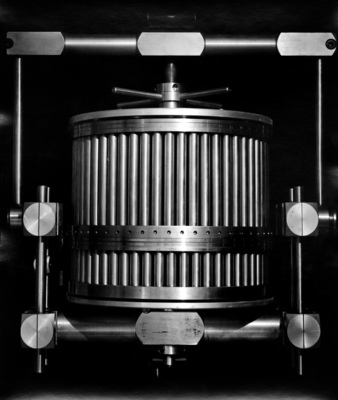 The first stainless steel machine, built in 1944, had twenty units. Transfers were made by rotating the upper section over the lower one.The machine was developed at The Rockefeller Institute during World War II by Lyman Craig and Otto Post. In Craig's words, Post should get "most of the credit." Mr. Post built it in his home at off hours using an old broken down lather. It worked surprisingly well and solved problems in the critical antimalarial drug field in such a striking way that other laboratories demanded it.